I'm a traditional Oreo fan (and sometimes I crave the Gingerbread Oreos). My husband, on the other hand is a Double-Stuf kind of guy. Even though we don't agree on the best kind of OREO, we do agree that they are a favorite cookie at our house. One other thing we may not see eye to eye on is this: My husband is the BEST Dad (but he's humble and doesn't always realize it). This holiday, in addition to snagging him a few gifts, I'm sending him this cute e-card from OREO. Wanna Win? 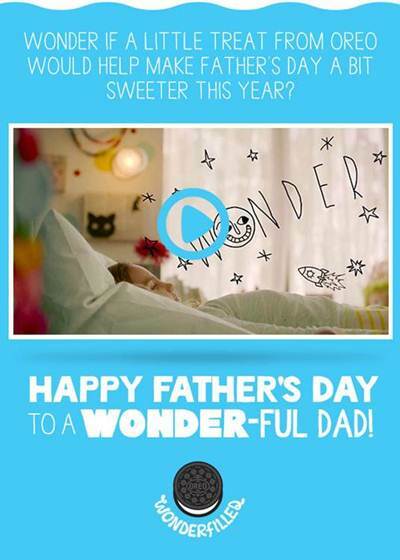 We'll be giving one lucky sender the following prize so that your special dad can twist, lick, and dunk in style! To be entered to win, just tell us who you would share the video with. Is it your Dad, husband, or another special guy? You have until this Sunday, June 16th at 11:59 pm CST to get your entries in. One per person, please, open to U.S. residents age 18+. We'll randomly pick one winner to get the prize. Full promotional rules here.